Our people are at the heart of our firm, and our firm’s success is dependent on the exceptional performance of our people. 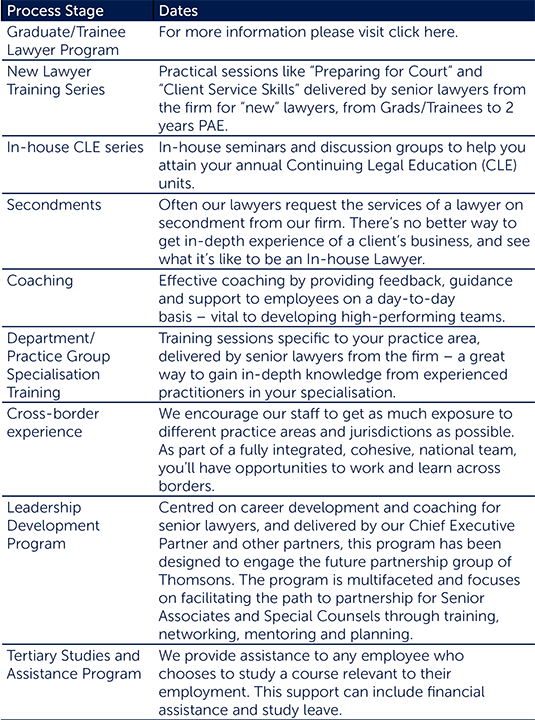 We will provide you with support and guidance throughout your career, as well as the tools and training to keep your progression on track – whether you’re on the path to becoming a Partner, or you’re more focused on honing your legal expertise in another role. Aside from our Graduate program, which is designed to be for a one-year term, there are no set timeframes for progression – if you’re talented and ambitious and meet all of the criteria to be considered for promotion, we’ll give you the right support to progress through your career when you’re ready. Everyone’s path is individual, but the diagram below demonstrates, as a general guide, the time-frames for progression. Partnership is an achievable goal and, since 2015, the firm has promoted 19 Partners internally from either Senior Associate or Special Counsel. We also understand that partnership is not an aspiration for all future leaders. The firm sees this as a valid choice and believes that a diverse mix of goals at the senior level of our firm is vital. A structured and tailored induction program is provided to all new employees starting with the firm to cover off on all systems and team-specific knowledge. Internal networking groups help new employees integrate into our business quickly and effectively.